Pacifica School Volunteers is a nonprofit organization designed to support and enrich the education and well-being of children in Pacificas public schools, and to strengthen ties between families, community and the schools. We believe that when the number of responsible adults invested in the schools increases, that both the schools and the community benefit. Pacifica School Volunteers was awarded the International Reading Association's Celebrate Literacy Award, the Starbucks Bay Area Grants for Giving and the San Mateo County Children's Report Award for "Helping Children Succeed in School". In every classroom there is at least one child who could benefit from the extra attention of a volunteer working with him or her on reading, math or other subjects. Studies show that this individual attention is beneficial to the academic and emotional well-being of children. Evaluations by teachers report that the children benefit from working with our volunteers and show academic improvement. 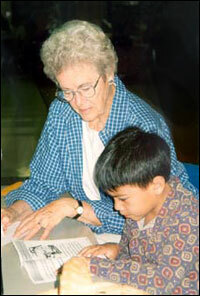 Volunteers also bring skills and expertise to the classroom. There are many ways to volunteer. The time commitment can vary from a one time experience, to several visits, to once a week in a classroom. Click on Ways to Volunteer; below to find out how you can help or call (650) 355-9432.